When buying new flooring for your home, tile is one of the most versatile options. It’s durable, it’s easy to clean, it’s cost-effective, and it will last you a long time. But there are all different types of tile available, and all different ways to use it. What do you need to know when shopping for a tile floor? What factors should you consider? Here’s a brief guide. The most common type of tile flooring is ceramic. It’s hard and durable, making it great for areas with heavy foot traffic. It’s also fairly low cost. While certain types of tile can run into money, prices start much lower than, say, hardwood, and with careful budgeting, you can get a great floor cheaply, which will last you a long time. You can also get stone tiles. Also very durable, they’ve got a great, natural look about them, and come in a variety of different colors. The drawback is, they’re not naturally waterproof, like ceramic tile, and would need to be sealed during installation to protect against spills, leaks, and other types of water damage. Finally, there’s porcelain. Porcelain tiles are much heavier than ceramic tiles, making them even more durable. They’re resistant to cracking, as well as fireproof. They’re also less porous than ceramic. While ceramic’s absorption rate is generally around three percent, porcelain’s is less than a tenth of one percent. This makes porcelain tiles even more water and stain resistant. On the other hand, since porcelain is so much heavier, it’s also harder to cut, which in turn makes it much more expensive, as well as harder to install. But once it’s in place, it will last you for decades. There are a variety of other things to consider when installing hardwood floors. For instance, there’s installation. Do you want to install it yourself, or hire a professional? If you want to save money with a DIY job, it might behoove you to get interlocking tiles, which snap together easily, without a lot of hassle and mess. You also need to consider your grout lines. How wide do you want them to be? Grout lines are the lines in between each tile. Some prefer larger ones, for aesthetic reasons. Some flooring styles lend themselves to wider lines between them. However, others like to have their grout lines as tight as possible, because they’re more difficult to keep clean than the tile itself. If you want tighter grout lines, it’s important to get rectified tiles. These are tiles that have been cut and finished mechanically, making them perfectly uniform. The size and shape of the edges of each tile are exactly the same, making it easier for them to be placed closer together. Tumbled or chiseled tiles have variations between them, which make them better suited for wider grout lines. These are just a few of the things to consider when shopping for tile flooring. What type of tile you get depends on a variety of other factors, such as what room you’re putting it in, the amount of foot traffic it gets, your overall budget, and more. Talk to a flooring expert to help you work out the details of what type of tile is best for your home, and how best to install it. 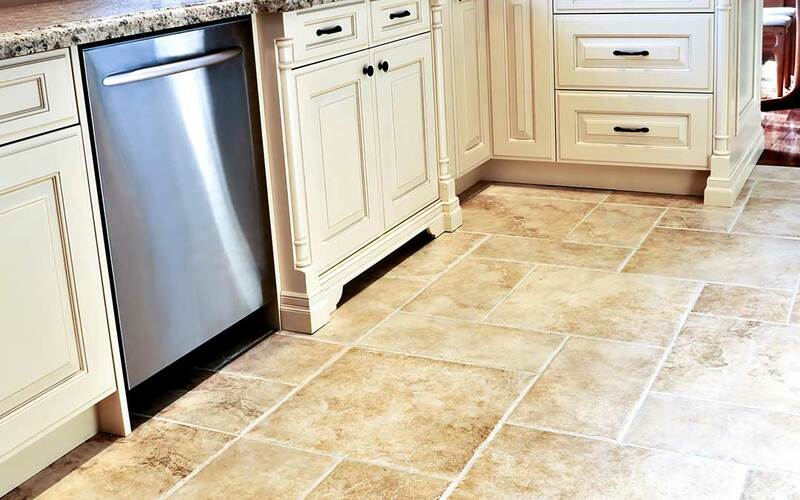 A good tile flooring, properly cared for, can be a great addition to your home’s décor, and last you for years to come.